When asked whether or not higher education (HE) is a private or a public good, most people on both sides of the Atlantic would initially say it is a public good. Not surprising, since education has always been provided in some form or another by the government to educate the people. HE is not different in that sense. It serves the public through teaching and research, thereby creating a well educated workforce for a country’s society as well as informed citizens. A country can benefit in many ways from a highly educated populace. Examples being: increased tax revenues from higher salaries, greater productivity, less reliance on government financial assistance, improved ability to adapt to new technology, and increased consumption. Alongside public benefits are private benefits that may come with HE such as higher salaries, sustained employment, and an overall improved quality of life. However, after taking a second look, the assumption that HE is solely a public good might become less and less accurate. The purpose of this paper is not to give an absolute answer to this question, but rather to discuss this topic on the basis of personal experience gained by participating in the 2015 Global Perspectives Programme (GPP) of the University of Basel and Virginia Tech. Further, it will also address differences and similarities in both Switzerland and the United States. Before discussing the different perceptions of HE in the respective countries, it is necessary to define what a private or a public good is. Is the good excludable? Meaning: Can people be excluded from using the good. Is the good rival? Meaning: Does one person’s use of the good prevent another person’s ability to use the good. Using this distinction as well as Paul A. Samuelson’s theory, goods are therefore private or public (disregarding two further distinctions of common resources / club goods (excludable but non – rivalrous) and common goods / natural monopolies (non-excludable but rivalrous)). Private goods are both rivalrous and excludable. Examples of private goods are food or paid clothing. Public goods, on the other hand, are neither excludable nor rivalrous. Examples of pure public goods are national defence, or flood-control dams. For most of these goods, the state assumes the dominant role in making them available. Another example of a public good is the creation of knowledge (e.g. a theorem), as it is freely available to everyone and also its use does not diminish another person’s ability to use it. However, when determining whether or not HE is a private or a public good, the answer proved to be more complex then initially expected. First, even though provided for the public, not everyone can access it and second, even if one might theoretically access it, there are factors such as cost, living, mobility etc. that makes it hard or even impossible to benefit from HE. An easy way to exclude someone from using a good is to charge money for it. HE, in that sense, is not different. The moment one has to pay a certain amount of money for HE, certain people will be excluded. On an international level, the 1966 International Covenant on Economic, Social, and Cultural Rights addresses this issue by stating that: “Higher education shall be made equally accessible to all, on the basis of capacity, by every appropriate means, and in particular by the progressive introduction of free education”. Further, the United Nations Educational, Scientific, and Cultural Organization (UNESCO) at the 2009 world conference on Higher Education concluded that the strategic role of HE in human development remained crucial as ever. The UNESCO communique also states that HE as a public good, is the responsibility of all stakeholders, especially governments. This is also an indication that HE is generally regarded as a public good. Although a very important step towards the possibility of HE being accessible to everyone, and acknowledging the important role of the government, HE is still an excludable good. The fact that cost for HE plays an important role in the accessibility of HE is especially evident in the US. Without going into too much detail, the US HE system consists of public and private universities and colleges, liberal arts colleges, and community colleges. All of them are to be considered non-profit universities. For-profit colleges and universities in the US are, by their very nature, business entities and shall therefore not be discussed further. They clearly fall in the category of offering HE as a private good. Most of the well-known and elite universities in the US are private universities. These universities are not operated by the government, but students may receive grants or public loans. Therefore, they do not meet the definition of offering HE as a strictly private good. The more disturbing fact is that even in public HE institutions, US students will soon be forced to pay the larger share of the cost of their education. Meaning that also public HE institutions in the US exclude an ever-growing group of people from HE. This is more evident when having a look at recent data for student loans. 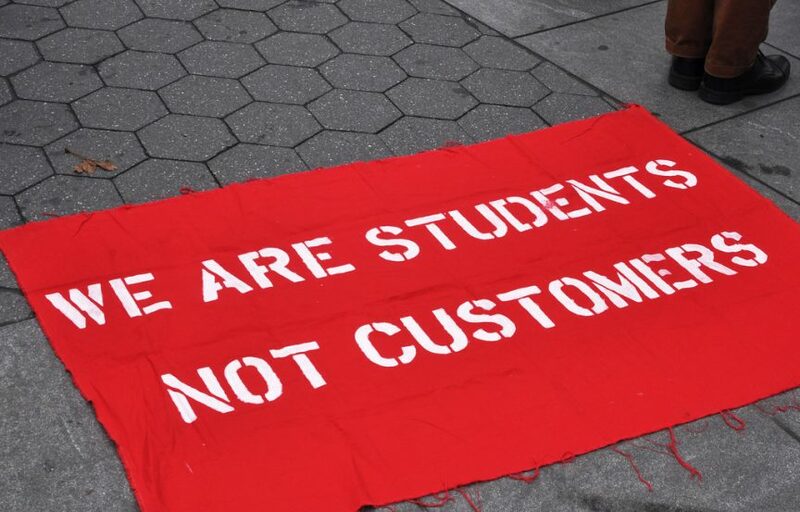 There are more than 1.2 trillion US dollars in outstanding student loan debt with 40 million borrowers who carry an average balance of 29,000 US dollars. Therefore, HE is shifting from being a public good towards something that is bought and paid for. The Swiss HE system, briefly summarized, consists of universities, universities of applied science (Fachhochschulen), and teacher training institutions (Pädagogische Hochschulen). All of them are public institutions. Though there are a few private universities in Switzerland, they are not discussed in the context of this paper for lack of importance. The fundamental difference between Switzerland and the US is that the majority of cost is paid by the public and not by the students. Even the tuition cost paid by the students is considerably smaller than what students in the US have to pay. Although cost can theoretically exclude people from HE in Switzerland, I would argue that in reality this is not yet the case. Even if one assumes that there are exclusions, it is definitely not comparable to the situation in the US. Therefore, HE in Switzerland can be considered to a higher degree a public good compared to HE in the US. Determining whether HE is a public or a private good only by way of excludability would profoundly simplify the reality. One must take into account that most people, when talking about HE being a public good, mean that there are positive externalities, simply known as social and public benefits. Learning to think critically, for example, helps and benefits the individual and in that sense is a private good. However, it also makes people more sophisticated and well-educated citizens that benefit the society as a whole. HE similarly fosters greater innovation and productivity, improving everyone’s life and not just the lives of those who paid for the education. Because of the contributions made by people being part of the HE system, there are more new services and products for everyone to benefit from. According to a study by the Institute for Higher Education Policy, public social benefits that are connected with people having gone to college include reduced crime rates, increased charitable giving or community service, increased quality of civic life, and social cohesion or appreciation of diversity. In other words, the benefits of HE are shared by those involved in HE and the society in general. In light of the public benefits that are generated by HE, it can be argued that HE in general can be viewed as a public good. However, one has to keep in mind the increasing cost of HE and the fact that the role of the state has changed over the years. The cost of HE is shifting from the state to private individuals or entities, thereby making HE a less public good. As seen above, the US is facing far more challenges regarding costs than Switzerland. Yet, also the Swiss HE system has to rely increasingly on other resources than the ones provided by the state. Contrary to the US, where private funding and contributions are a normal and important source of funding for HE, Switzerland has its struggles with this approach. A perfect illustration for the different mind set in Switzerland is the case of the UBS International Centre of Economics in Society. It is associated with the University of Zurich, but financially supported by UBS with 100 million Swiss Francs. The money, amongst others, shall be used to fund permanent chairs, scholarships, and assistant professors. After the collaboration became public, 27 faculty members of the University of Zurich signed and published the International Appeal for the Protection of Academic Independence in order to: “(…) safeguard the precious heritage of free and independent scholarship, and to avoid endangering the academic ethos in controversial collaborations”. This is only one of many examples to show that the idea of HE being a public good is very much settled in the mind set of Switzerland and that private institutions are not always welcome. However, this example also shows that Switzerland has to adapt in order to face challenges in today’s HE system. The UBS Centre still exists, despite the appeal having been signed by more than 1000 individuals associated with the HE system in Switzerland and in Europe. The initial answer that HE is a public good has, if not changed, at least been challenged during the course of this paper. Although, it is undisputed that HE generates many benefits for both the society and the individual consumer. The assumption that HE is a pure public good, is, at least for me, no longer beyond reproach. Increasing costs for tuition combined with the decrease of public spending for HE has made a deep impact on current and future students and academics both in Switzerland and the US. As a result of these changes, HE as a public good might shift towards becoming less public and more private. This shift is not only evident in the US, but also in Switzerland, albeit less obvious at the moment. However, I would argue and hope that higher education will never become a pure private good for a couple of reasons. A private good by definition excludes people from using a good; in this case HE. This means that many possible talents, visionaries and intelligent people might never get the chance to benefit from HE and because of that, society itself will not benefit from their ideas and inventions. Therefore, both parties lose; the student who has no access to HE and society for not benefiting from possible new knowledge. Further, denying people access to HE will inevitably lead towards two classes of citizens: the ones who can afford HE and the ones who can not. As seen above, there are many initiatives on both global and regional level to ensure that HE will not become an exclusive good and to prevent inequality. However, in reality, this shift towards two classes of citizens has already started.